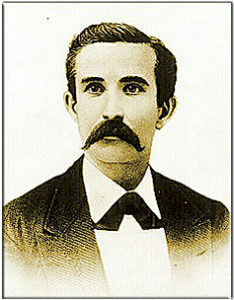 John B. Jones was born 22 December 1834 in the Fairfield District, South Carolina. The family moved to Texas in 1838, settling in the area that became Travis County. They later moved, finally settling in what is now Navarro County. Jones attended Rutersville College near LaGrange and Mount Zion College in Winnsboro, South Carolina. During the Civil War he enlisted as a private in Benjamin F. Terry's Eighth Texas Cavalry, but left that regiment to become adjutant of Speight's Fifteenth Texas Infantry with the rank of captain. By the end of the war he had been promoted to major. He was known as a man of coolness and quick judgment, a skillful soldier and someone to trust in a difficult situations. Following the war Jones went to Mexico to attempt to locate a site for an expatriate Confederate colony but soon returned to Texas. He was elected to the state legislature as a representative in 1868 but was denied his seat by the Radical Republicans. When the Frontier Battalion was created in 1874, Jones was appointed to head the organization. Though soft-spoken and slightly built, Major Jones soon won the respect of the men under him. Not only was he an administrator, he was a strategist who was often in the field with the companies, not just directing the force from an office in Austin. In July 1874, Jones led a contingent of Rangers, numbering less than forty, against a combined raiding party of more than 125 Comanches, Kiowas, and Apaches under Lone Wolf at Lost Valley. The Rangers were able to hold out against the Indians for more than a day before help arrived from the U. S. Army The Frontier Battalion under Jones was able to help put an end to the Indian raids on the frontier as well as quell numerous incidents of civil unrest. As an administrator Jones was expected to run the Frontier Battalion with a set amount of money. Besides filling in the necessary muster rolls of their Companies, company commanders were also expected to keep detailed records of the expenses of the company. These records were then forwarded to the quartermaster where they were carefully examined. For example, to insure against guesswork or fraud in valuing lost horses, Jones had each horse in Ranger service appraised by three civilians and the value put in writing. There were no exceptions to this rule, even Jones' horse was appraised. In 1879 Jones was appointed Adjutant General of the State of Texas. His expanded responsibilities hindered his habit of visiting every company in the field several times a year, but until his death in 1881, he continued to give the Rangers his personal attention. John B. Jones died in service on 19 July 1881. He was buried at Oakwood Cemetery in Austin, Texas. "It would be difficult to overstate Jones' importance in the development of the Rangers. . . [He] put his brand on the form and style of discipline, morale and conduct. He set the standard for administration, . . . Jones developed a business-like fighting force which he personally supervised, riding up and down the frontier each year. . . . he never lost his love for his men. . . ; he knew each officer and noncommissioned officer and many of the privates. . . . Without him the Rangers would probably have been dissolved, and it is a tribute to him that in his day he was known, admired and respected as the Texas Ranger."